Portugal was called, long before the Romans, Terra de Ofiusa, "Land of the Serpent." The period of Portuguese greatness began in the 15th century when Portuguese sailors explored the Atlantic coast of Africa, round the Cape to India and west to Brazil. The earliest known reference to playing cards in Portugal dates from 1490. Cards and other games were subjected to the same prohibitions as in other European countries. A special group of early Iberian playing cards, with dragons on the Aces, are known as Dragon cards and early examples made in Spain by Francisco Flores survive. These were made using a method which was also used in Italy and the shape and arrangement of the suit symbols is more aligned to Italian rather than Spanish ones. Examples of these cards have been unearthed as far afield as Netherlands and Peru. 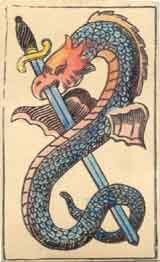 Portugal has also influenced the playing cards in many parts of the world and the so-called 'dragon' cards reached as far as Japan, Java, Indonesia and Brazil. 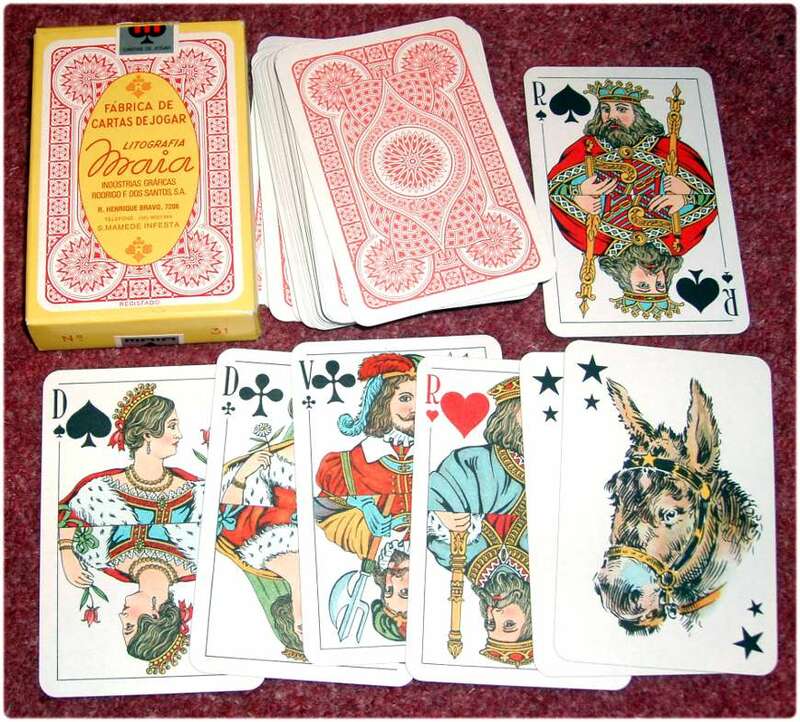 The Real Fábrica de Cartas de Jogar was founded in 1769, along with a paper mill, by Royal Charter of King José, under the master craftsman Lorenzo Solezio, brother of Félix Solesio who ran the Spanish Real Fábrica at Macharaviaya. 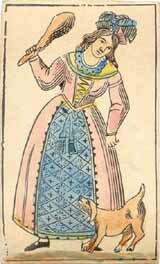 The production and sale of playing cards was a profitable business. 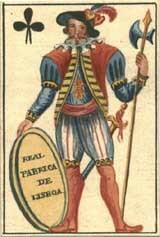 In 1769 the Royal Playing Card Factory was annexed to the Impressão Régia (Royal Press). 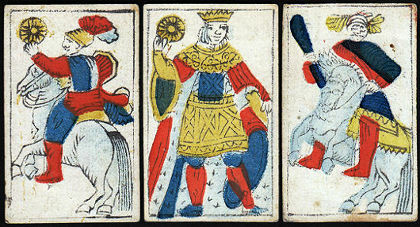 Above: various examples of Portuguese playing cards. Click images to see more. A Royal Decree, dated 24th December 1802, refers to the Impressão Régia, including the Portuguese Playing Card monopoly, and ratifies the earlier legislation regarding the playing card monopoly and sets out updated regulations governing the industry. Nevertheless, the Decree dated 18th May 1808 dealt the first serious blow to this factory’s production through the establishment of a similar factory in Brazil. At that time King John VI and the entire Portuguese Court were in Rio de Janeiro. A decree dated May 1810 announced price increases due to scarcity of paper and also referred to Spanish, French and Portuguese cards. The Real Fábrica de Cartas de Jogar was nationalised and this was the beginning of the end of one of Portugal’s most profitable manufactures. The decline was not directly caused by the introduction of other factories in the market, but by the imposition of the stamp duty in 1832: although other factories could easily evade the law, the State factory couldn’t, and so it became harder to compete in the open market. In 1837 a lithographic machine was set up in the National Press (as it was then called) which, until 1843, worked exclusively at printing playing cards. However, in 1856 The Fábrica Nacional closed down, and Belgian and other card makers stepped in by producing Dragon cards for Portugal and Brazil, and Dutch-style cards based on German models. Over its 87 odd year lifetime, many decks were created and sold by this Portuguese manufacturer. 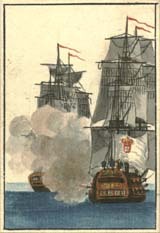 In 1834, for example, there were Indian cards, the deck of the Four Parts of the World; Manuel Luis Rodrigues Viana’s Constitutional Cards, which were available in two different versions; cards allusive to 12th September and 5th November, etc., adding up to a total of 16 different types of deck. An important clue to dating Portuguese playing cards is the presence of tax stamps and/or manufacturer's details printed on certain cards - often the Four of Diamonds or Hearts. This included cards imported from other countries, such as Germany or Switzerland, and also including Mme Lenormand Fortune-Telling packs and Mexican Bullfighting packs. Manufacturers include Impressão Régia, Germano & Ca (Lisbon), M.A. Beato, Justero Rodrigo, Costa & Valerio, J.J. Nunes and Litografia Maia. Card-making in Portugal today has lost a lot of its former glory and is virtually limited to the output of Litografia Maia of Oporto. Above: playing cards by Litografia Maia of Oporto. Thanks to Fernanda Frazão and José Manuel Murcia. 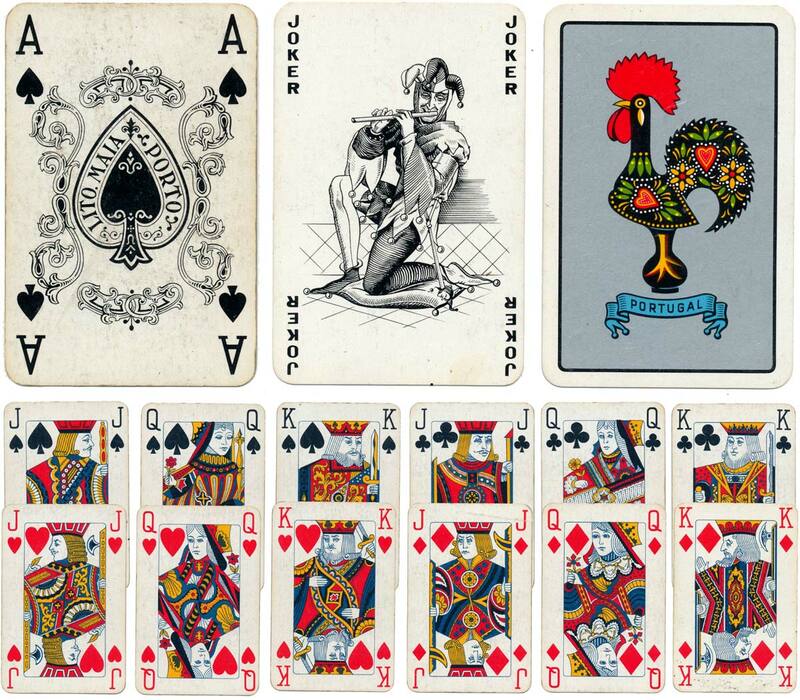 For more information about the history of Portuguese playing cards see the two publications by Fernanda Frazão listed in the bibliography and which are available from the publishers. Also see: García Martín, Enrique: Naipes Portugueses in La Sota Nº 16, Asescoin, Madrid, March 1997, pp.3-26.